To quote John Cleese; “And now for something completely different.” Cheatin’ brings something completely and refreshingly original to the screen, an unusual full-length feature that the majority of audiences won’t have seen the like of before. 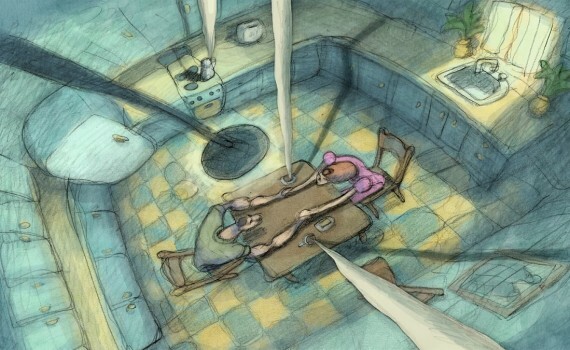 Fully animated, non-speaking, and running 70 minutes long, this film is Bill Plympton’s baby and a movie that is definitely not something you see every day. It’s a romantic/tragic opera written & drawn by Plympton following two characters during their love affair and possible collapse. There are no actors, just sound effects, artwork, and music. There are no breaks, just a bit over an hour of storyline and drama. And there is no doubt about it, this is a movie that you had better prepare yourself for, because the classic feel will be twisted, the anticipated animation will be changed, and the result will most likely be something you didn’t expect. Jake & Ella are destined to be together. They meet at a carnival, a place where magic is waiting to happen. Jake is there with another girl, someone of no consequence. Ella is there alone, admired for her beauty but teased for her airs. On the bumper cars, a fateful accident bring the pair close together, Jake acting as the hero, Ella the damsel in distress. And so begins a love affair that could not possibly be more storybook. But, oh there’s always a but, not everyone is happy to leave true love alone. A jilted would-be cheater wants Jake for her own, stages an uncomfortable scenario, and convinces the devastated Jake that Ella has been unfaithful. Heartbroken, Jake begins a parade of loose women, staving off the sadness that Ella’s betrayal has brought him. Confused, because she’s always been true, Ella investigates the change is her man’s life, and discovers his terrible secrets. It really is an animated opera, with music as the background and tragic events as the plot. It’s sad, honest, troubling, but with the possibility of a happy ending, a classic set up with a modern twist. The artwork is beautiful, drawings by Plympton brought to life one sheet at a time. And there’s cleverness to the directing & writing, jokes added in at just the right moment and subtle touches throughout. But before I sound like I’m singing its praises, Cheatin’ is a difficult movie to watch. At only 70 minutes, it’s way to long. It would play much better as a short, as I grew weary too early after so much of the same idea, the same characters, the lack of any dialogue, the constant music, the over-dramatic events. Plympton may well be a genius, but he needs to spruce up his medium, add some life & entertainment to his ideas, if he wants to appeal to a greater audience than just film critics and art aficionados.